This post was brought to you by the United States Air Force. Click here to learn more. It’s a Tuesday in September 2001 and Michael Hingson, the Mid-atlantic sales manager for a Fortune 500 computing company, is prepping for a corporate training session with his colleague David. Michael’s the head of the New York office, overseeing seven employees. Their office on the 70th floor of Tower 1 offers a stunning view over lower Manhattan, the Hudson River, and New Jersey. It’s a thoroughly typical, normal day at work. For now. 8:46 AM: a muffled explosion. The building shudders. Michael and his colleagues begin to realize something is terribly wrong. Debris is falling past the windows outside. They have no way of knowing an airliner has slammed into the North Tower 25 floors above them. Suddenly, Michael is a typical office worker thrust into an extraordinary, terrible situation: the worst terror attack ever on American soil. Except Michael isn’t typical at all. Amongst the many extraordinary people in the World Trade Center towers on 9/11, Michael stands out because he’s totally blind. And amongst the many heroes from that day Michael is exceptional because of what happened next. Michael’s co-worker David starts to panic. Michael tells him, “we’re going to get out, but we need to do it an orderly way.” Michael guides his coworkers to an emergency staircase and leads their descent to safety as the stairwell fills with choking smoke. At the 30th floor, he’s met by NYFD firefighters and declines their assistance so they can help others. As he descends, floor after floor, other panicked people see Michael, calm and encouraging, and follow his group to safety. Michael Hingson is an American hero. But he’s something more. How exactly did a blind man caught in the North Tower of the World Trade Center not only save himself, but help save so many others? What was different about Michael from those who succumb to panic? What hidden aspects of his past, personality, and skill set enabled him to do what he did? He’s an example of remarkable, improbable leadership in crisis. 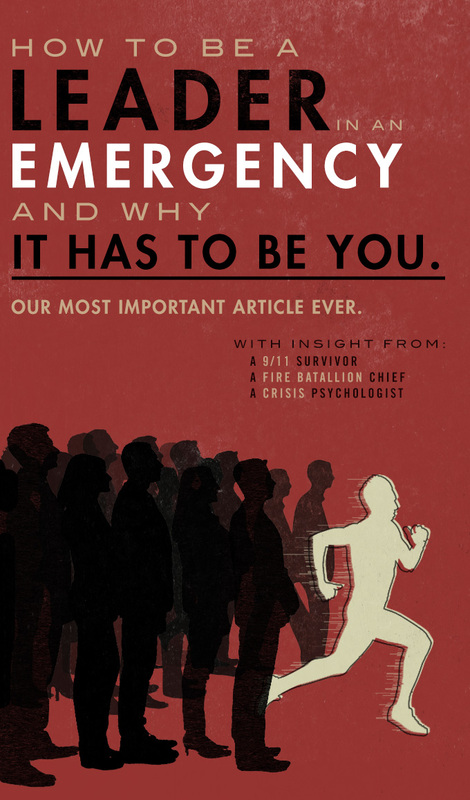 What can you and I learn from Michael about how to be a leader in an emergency? What does he teach us about being an everyday hero, every day? What Stops Good People from Stepping Up? Emergencies happen. They will happen to you. And if you’re like most people you’re probably OK with that – at least, in the abstract – because you assume you’ll act appropriately. In our culture, we love to watch action movies starring a hero who does the right thing every time, no matter the personal cost. If you ask most people they’d probably say they share those same action-hero values. Aliens invading? Sign me up. Killer earthquakes ravaging the west coast? I’ll co-pilot for my buddy Dwayne Johnson. But what happens when you see a homeless man fall in the street? Do you help him up? The problem with our hero narrative is many people simply don’t step up. And I’m no exception. I lived in New York City for ten years. Nearly every summer, someone would collapse on the subway or sidewalk in front of me. It was often an older person who simply got overheated. So what did I do? 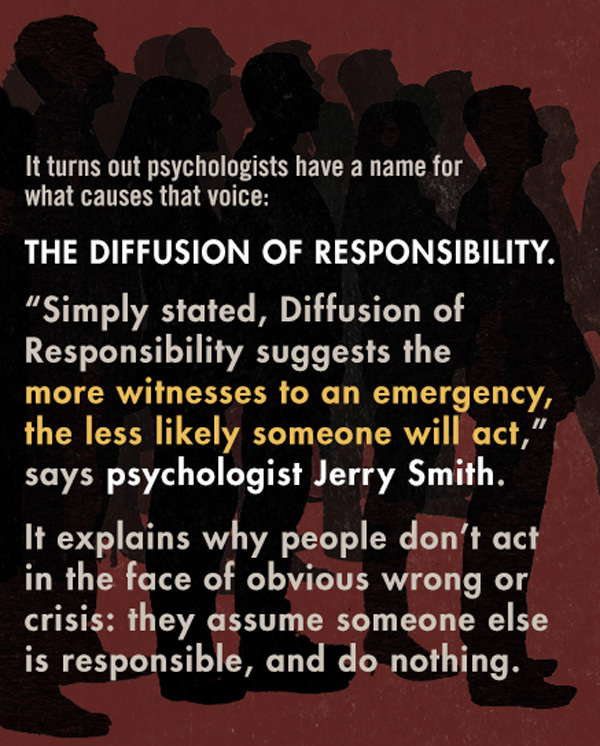 It turns out psychologists have a name for what causes that voice: the Diffusion of Responsibility. “Simply stated, Diffusion of Responsibility suggests the more witnesses to an emergency, the less likely someone will act,” says psychologist Jerry Smith. It explains why people don’t act in the face of obvious wrong or crisis: they assume someone else is responsible, and do nothing. If your response to the Kitty Genovese story is, “That should never happen again,” you’re in good company. The question is, what can you do to ensure it doesn’t happen, at least not on your watch? Showing leadership in a crisis can take many forms, but all action starts with acknowledging a single, simple fact: you can make a difference. So how do you rate your competency? Chances are, you’re undervaluing your capacity to lead in emergencies. Our assumption is leaders are like artists: either you’re born with the genius to be steady in crisis or not, but that’s simply not the case. Countless examples show untrained non-professionals can respond; guys like you, me, and Michael Hingson, the blind computer salesman caught in Tower 1 on 9/11. At first glance, Michael is an unlikely leader, but that’s exactly why his story is so damn useful. Peer a bit closer and you’ll see he was, in fact, uniquely qualified to lead a group of panicked evacuees 50 stories to safety. There are three actions Michael took before and during 9/11 that allowed him to do what he did. The first is obvious, unglamorous, and utterly important: preparation. As he tells it, “When I first went to work at the WTC, I was the one and only blind guy in the office. I spent a lot of time thinking about – what am I going to do in an emergency? What if I’m there alone? What if my employees are there?” Mindful of bombings in the 90s, he spent the first month learning the layout cold. “I got to the point where I could say, ‘I can’t get lost in here.’” When the attacks happened, Michael was able to quickly and confidently guide his colleagues to the emergency exit. Battalion Chief Michael Annese echoes the primacy of preparation. “We train for active shooters, hurricanes, fires, stabbings, heli evacs, etc., so when the incident comes you have that muscle memory.” How does this apply to you? Do a quick risk assessment of your daily routine. What are the riskiest places and actions you undertake every day? Where are you likely to encounter an emergency? As a quick exercise, visualize coming up to a car accident at a busy intersection near your home. You call 911. With emergency services en route, you’re the only person on site. What’s your first move as you exit your vehicle? “You want to be aware of oncoming traffic,” says Annese, adding, “tunnel vision on the crash site is a common risk.” Next, take note of the hazards. “There’s an inner and outer circle of any crash,” Annese advises. 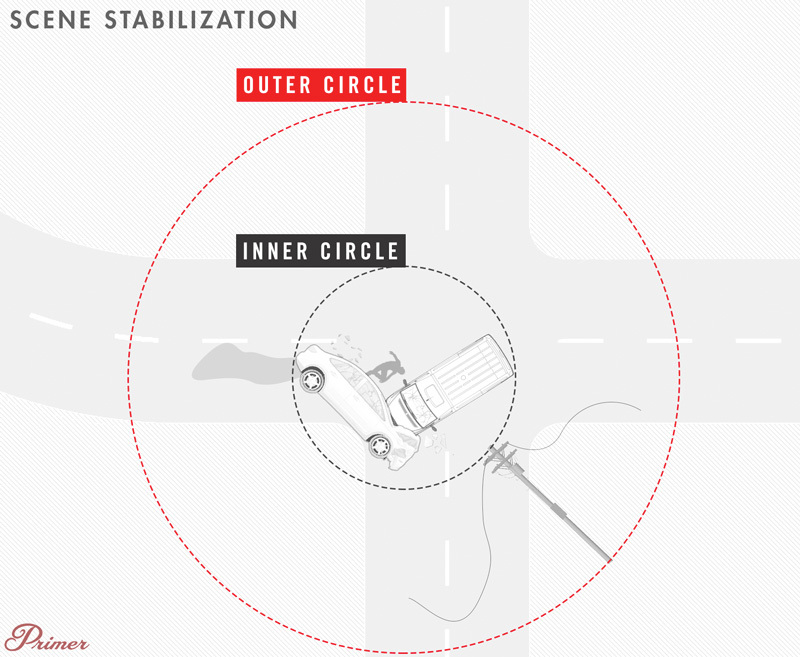 “Look for downed power lines, gasoline, and other dangers at the outer circle.” Then, move to the inner circle and if you’re able, render care. Embedded in this visualization is something Annese stressed over and over: situational awareness. In Tower 1 on 9/11, Michael Hingson brought a singular situational awareness to events unfolding around him. 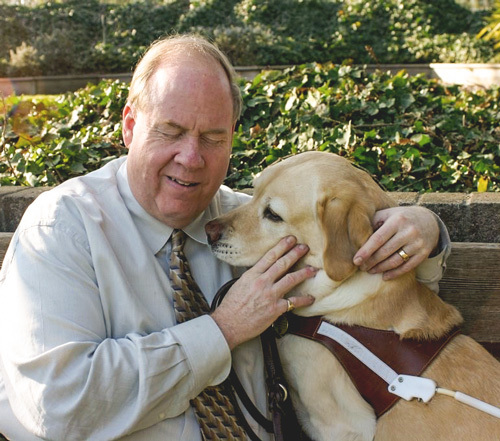 Shortly after the plane hit, his seeing-eye dog Roselle woke from a nap under his desk. She was calm. “Roselle’s attitude told me whatever was happening wasn’t such an imminent threat that we couldn’t react in an orderly way,” he says. As Michael and his group descended, his blindness was the opposite of a hindrance. Working with Roselle, Michael wasn’t as affected by increasingly smoky and chaotic conditions, which allowed him to project a calm and optimism that was a beacon to others. This key fact reveals lesson number two: in a leadership situation, use whatever unique assets you bring to the table. Michael’s situational awareness was, in fact, superior to his sighted colleagues due to a lifetime of honing his non-visual senses. He even figured out what had happened based on the smell of burning jet fuel in the emergency stairwell. Where others might see weakness, Michael brought strength. Have you stopped to consider and properly value the assets you bring to an emergency? The core principle behind SIN is to ensure that anyone attempting to help doesn’t inadvertently become victims themselves. As Battalion Chief Annese explains, “In the movies, they show firemen taking their masks off and giving it to someone else, but that’s a fiction. If you’re helpless you can’t help anyone else.” In summary, SIN means: Secure your own safety. If the scene isn’t safe, isolate and secure it to prevent others from entering. If it is safe, notify authorities and move into render care. Thank you Mr. Brown! This was definitely an important article! Great freaking read!!!! I plan on taking a course that will further dive into this subject because I feel I will be in a situation, that will happen when I’m with my little girl, in where I need to be at my best to assess and get out of. The book was a great read and I recommend it to anyone! All I can say about this book is…tactical pen baby! 1. Take some MMA classes and become proficient in unarmed self defense. You can take those skills with you anywhere you go and no one can disarm you of your skills. 3. 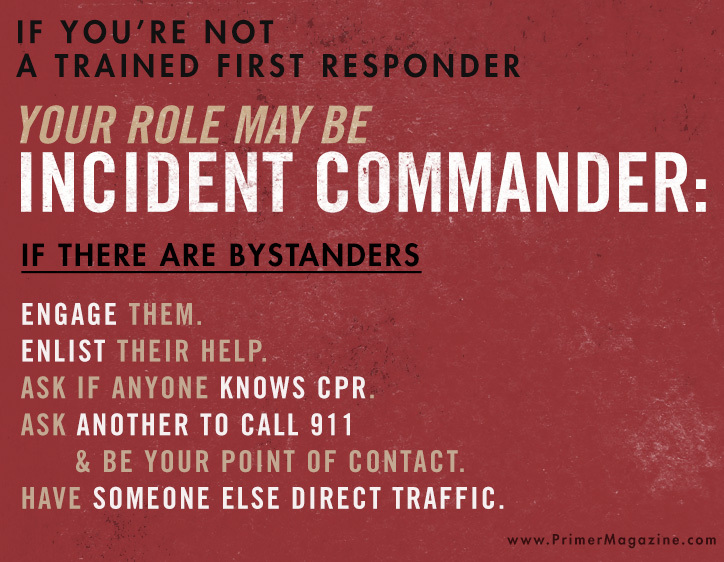 Do ride alongs with your local police/sheriff and experience emergency situations first hand. Make it an active experience by practicing situational awareness and watching the back of your officer/deputy. 4. Attend local C.E.R.T. training. 5. Get your concealed weapons permit. Get good training and practice carrying a firearm for the defense of yourself and loved ones. No. 3 and No. 4 are great suggestions! Thank you for that Lucas. I have a friend how is a State Trooper so I’ll get more information about the possibility of riding along or seeing if he can recommend someone who I can shadow. I do plan on getting a weapons permit and I’m also going to look into C.E.R.T. training. Timely! I’ve increasingly pondered what constitutes my civic duty in society, and I do think being able to render basic first aid/crisis management falls under that responsibility. Is there an organized database of first-aid / crisis response courses for civilians? I’ve casually been looking, and haven’t turned up much. At this point, I’m not even sure where to begin. As far as basic and advanced first aid you could try the American Red Cross or American heart association. You could also get your EMT certs, although those can be a little pricey for someone who isn’t interested in a career as a first responder(or part time job). Check with your local police department/sheriff’s office about courses. Many agencies are now providing a “citizen’s academy” where they teach you about first aid and response to an emergency. This is the link to FEMA Independent Study Program (ISP) course list Dr. Smith was talking about at the end, if anyone is interested. I think this article hits the nail on the head. If you visualize situations where you may need to help someone, you will be quicker to react when a situation arises. I feel that practicing in small ways, like helping someone pick up their dropped things, can help as well. The first aid training I learned as teenaged lifeguard continues to serve me 7 years after my certs lapsed. In my personal life, I have helped a woman in respiratory arrest, a drunk man who broke his neck diving into two feet of water, an underage girl suffering alcohol poisoning at a concert, all strangers. The keys are to get trained and take that first step when you first identify an emergency. The mindset of being prepared and ready to protect yourself and others is a crucial skill that all of us young men would do well to learn. As a police officer in a medium to large sized city, I have had training, but more importantly experience. I’ve met citizens who were entirely incompetent and hysterical during emergencies. I’ve also met citizens who took charge of a scene before our arrival and saved the day. One of the primary means of being prepared is not only having the proper mindset of “I can do this” but also the proper training. More and more citizens are understand and practicing the idea of Every Day Carry (E.D.C.). The gear and tools you have on your person on a daily basis is EDC. For example the average person may have a wallet with credit cards, a phone, and keys. Women get this idea a little more than the average men. They will have chapstick, mascara, tissues etc. But what is practical EDC for emergencies? 3. A back up battery for your mobile phone. Seek out training and go on ride-a-longs with your local police. 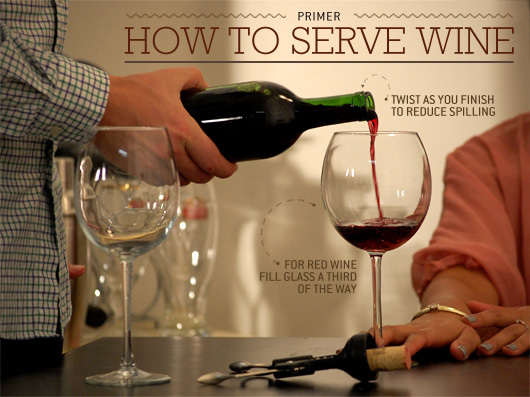 Experience emergencies first hand. Whenever I have a citizen ride with me, I hand them a pair of latex or nitrile gloves, just in case I need their help. I make it clear to them that I may need them to help or back me up in a bad situation where life is at risk. I won’t ask them to go in harm’s way, but they have to understand what they are about to encounter over the next 12 hours.